I was tired. Pooped. I was done Adulting for one day. Between trying to prepare for yet another move, eternal piles of laundry, and the antics of a spastic 1 year old dog, I was ready for an escape. It was time for a woman’s 3rd favorite four letter word: (after W-I-N-E ) I’m talking about good ol’ clean fun B-A-T-H. Earlier in the week, a very good friend had bestowed the girly-gift of some fabulous organic bath bombs. These babies are made for ‘Leap-ins of mass infusion’, filled with aloe and calendula, lemongrass, seaweed and everything a gal could want in relaxation. Grabbing my box of fizzy delights, I ambled up the stairs to the bathroom, informing my wife, who was busy between watching t.v. and playing a rousing game of online poker. “Okay, have a good trip.” she said, not shifting her gaze from the other online players. It was here that everything sort of went off course. It started innocently enough. I undressed, started the water, checked the temperature, and gently plucked a luscious smelling lemongrass and calendula bath bomb from the tin, breathed in the lemony aroma of effervescent rejuvenation of spirit and body, and plunked it into the running water. I watched as it fizzed and inhaled the aroma of lemon bursting from it’s center. It was then, like a Pavlovian response to water running, I needed to pee. It was also at this moment, when I noticed the spider. 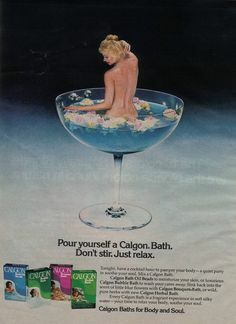 The spider wasn’t a large looming character, but a smallish quarter size encroachment upon my impending repose that was not in the brochure when I asked “Calgon” to take me away. He was perched up in the corner above the bath, but just nervy enough to want to continue his walkabout at the same time I was thinking of relaxing, and our simultaneous plans for this bathroom space were not going to coexist peacefully. One of us had to go. It might have been a thoughtful territorial dispute, brought to the U.N. with ambassadors from both regions represented fairly, but my bladder became an unruly dictator. I marched downstairs in my birthday suit, towards my weapon of choice: squeegee mop. I grabbed the mop and headed upstairs with an audible comment of “Babe, what are you doing?” quickly drowned out by my single minded mission. Upstairs to face my adversary, I assessed my position and battle strategy. I applied the “jab and thrust” technique, that worked so well with broom, but not so much with rounded sponge mop. 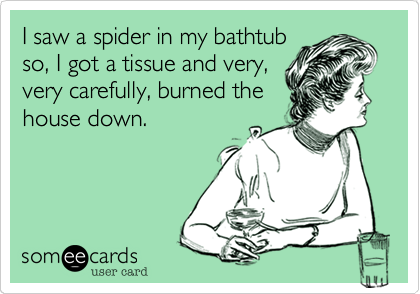 I mildly succeeded in dusting off the crumbs of the spider’s mustache. With a final swipe to the left, the spider was gone! I set down the mop, and climbed onto the tub side to make sure. Yes, sure enough, no sign of my “would-be assassin” was to be found. Feeling rather proud of my accomplishment, I settled my weapon behind the porcelain throne, hearing the bath still filling, and remembered where my urgency to kill had come from. I sat down to heed nature’s call and glanced down towards my valiant swiping mop settled by the toilet. I had been gazing at it fiercely, in case the “swipe” had not quite vanquished my enemy of effervescent luxury. When lo and behold, who comes strolling up over the roll of toilet paper with a strongly worded letter of disapproval in his furry hand? Yes! The Spider! I screamed and did what any person in a fight or flight pattern would do before they had their wits about them; I stood up. Now, here is where we learn the value of two life lessons: First and foremost, Gravity Always Wins, and secondly, Kegels are a LIE! Everything after this moment seemed as though it were happening in a slow-motion, Buster Keaton film; My wife burst into the bathroom after the scream, yelling “What’s wrong?”, Me shrieking “Get Out! 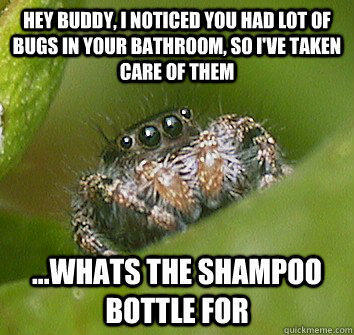 Just Get Out!”, grabbing a towel to kill the harbinger of amplification, and …………pee dribbling down my leg. There was really no salvage crew that could clean up this indignity. I dabbed up what I could, finished peeing the proper way my parents were so proud of once, and turned off the water. Entering at last, I sank into a lukewarm bath full of floating calendula bits, swimming in a furry film of dog hair from the dog’s last bath, pondering if Calgon had really just left without me, while all my dreams of relaxation and dignity just went down the drain. From the shower curtain, the dog poked a nose in to make sure I’m alright, and I really can’t answer that yet. I’m a grown woman. I really thought my piddling years were mostly behind me….except for when I sneeze….or laugh too hard…..or run….